"Nothing is cooler and more attractive than a big comeback, and that'll be me." 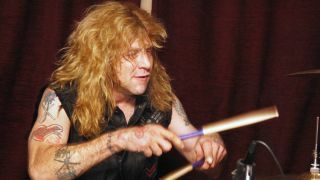 Steven Adler: "I want to achieve my destiny, and victory is a part of my destiny. I just can't drink." "I am back from the dead," says former Guns N' Roses drummer Steven Adler, referencing the title of the album from his new band, which also sports his surname. "But I'm not just feeling good, I'm feeling great. After the Rock And Roll Hall Of Fame, I started a new chapter. I went into detox for drinking. The last four months I've been sober, and it's great. I'm working out, practicing every day, putting a new show together, and it's really exciting." Setting the reset button has been tricky for Adler, who, since his firing from GN'R in 1990 for drug use, slid further and further into addition. In 2003, he put a band together, Adler's Appetite, which issued a handful of recordings, but for the bulk of the decade, his demons had the best of him. Well-publicized appearances on the reality shows Celebrity Rehab With Dr. Drew and Sober House cemented the notion that Adler was an incurable screw-up, but the drummer says that "being filmed while on drugs was the best thing for me. Everybody should do it." And now he says he's clean and sober and back for good. Adler (which also includes singer Jacob Bunton, guitarist Lonny Paul and bassist Johnny Martin) will release their rifftastic debut album, Back From The Dead, on 26 November via New Ocean Media, and according to Steven, "It's the new chapter that will be the best part of my life. I've got a new attitude, and the only thing that can stop me is me - and I won't let that happen anymore." Adler sat down with MusicRadar to talk candidly about his drug use, his rough times in Guns N' Roses, how he felt about Axl Rose's no-show at the Rock And Roll Hall Of Fame and his unbridled excitement about the new band. You say you're feeling great, and it's true that you certainly sound that way. "I am! [Laughs] I've been reading Joel Osteen, and he really makes a lot of sense. The way he says I should live, think and believe is the way I felt when I was a kid. Drugs messed that up for me. Once I got into drugs and alcohol, I was lost. I forgot what life was all about - and that's enjoying every day and being productive. I'm not the only one who's been through that. "But you know what? Nothing is cooler and more attractive than a big comeback, and that'll be me. That's what I'm working on now. I'm ready for it, I've got the album and the band, so I'm in line for the big comeback." The sound of the new band is more metallic than GN'R, which had a more bluesy rock 'n' roll side to it. Are you a big metal fan? "I'm not a big metal fan. I love and respect the musicianship, which is spectacular. GN'R was five guys who were all into different things. I liked pop and disco, Izzy was into New York rock, Slash loved Aerosmith and Led Zeppelin, Axl was into Genesis and Elton John, and Duff was a punk rocker. We all blended that stuff together. "The guys in my new band do that, too. We're all different. It was very easy working with them, because I've been through that kind of process of different types of people coming together." "When I was doing the Adler's Appetite thing, Lonny Paul came down when I needed a guitar player. He's the only guy who ever played Izzy's parts right. I told him that this was the last time I was doing Adler's Appetite. After that tour, it was done, and I was ready to go to the next level in my career - and life. The lyrics seem to address personal demons quite a bit - did you contribute to writing the words? "Yes. The thing is, the record is a concept album. It's the story of my life - wanting to grow up and be a successful musician, the trials and tribulations you go through, the crazy stuff. It's about a young boy who wants to be a success, who gets there, and then he goes through all kinds of things and he loses it. And then he makes that comeback. That's me." John 5 plays on the song Good To Be Bad. Are you a longtime fan of his work? "Here's the funny thing: John and I and our wives went out to dinner after he finished the record, and he told me the story that we knew each other and hung out in the '80s. [Laughs] I had no idea! Put it this way: I've been to Metallica concerts. I've stood behind Lars Ulrich as he played rums. And I'll tell you, I had no idea I've ever been to a Metallica concert. But John 5 says that he, Lars and I drove in John's car to Arizona. I don't remember that at all." Memory loss - does that happen to you a lot? "Yes! [Laughs] Yes, it does, and I'm not proud of it. I've done more things and had a lot more fun than I thought I did." Just Don't Ask features Slash - what's the story there? What was it like working with him after all of these years? "He came down to the studio, and it was funny - he threw me out of the room. [Laughs] He likes to do things with nobody around. But the magic went down. Making this whole record was magic. It was more fun than making Appetite For Destruction." Your drumming is terrific on the album, but let me ask you, because of your drug use, did you have to work to get your chops back up? "Absolutely. You have to relax when you play. Drummers are conductors - we set the pace for the music - so if you're not relaxed and feeling right, the whole thing goes out the window. I took drum lessons for a year. I was determined. Greatness is taken and not given. "I worked on everything, from my attitude to my triplets. I want to be in the big show, and to be in the big show, you have to practice. I have this attitude now that I'm going to take all the greatness I can. Nothing's going to stop me." Your drug use in GN'R - was that brewing for a while, before the band even formed? "Totally. It started for me when I was 11, the first time I smoked pot, which I just so happen to enjoy. [Laughs] When I did it, it was something I really liked. I thought I found God when I smoked pot. But when you're a kid, you think you know everything. "The drugs got really bad when we didn't even have to ask for them. Drugs would just be there. It got to be too much. I wasn't a big drinker at first - I was into cocaine. But when you do coke, you like to drink. It got worse and worse. I had so much coke in the '80s, I would just throw it away, just give it away. It was everywhere. And then heroin came in, and it all went downhill. "The other guys weren't straight arrows, either. After it all happened… they didn't even realize what was happening to me. Everybody handles situations differently. When they came to me and said, 'You have to straighten up,' I had two choices: either get it together or keep doing what I was doing. I chose the wrong path." Who gave you the news that you were being fired from the band? "It was management. It was the band's choice, but they didn't realize what they were doing. And I don't blame them. I only blame myself, you know? Some people in their lives can get away with it. I couldn't." Before you were let go, what was your personal relationship like with the band members? "It started off where Axl was doing his own thing, Izzy was doing his thing, and me, Slash and Duff were like brothers. We did everything together. In the Paradise City video, you see the three of us walking onto the Concorde - we didn't even know where Izzy and Axl were. Near the end, Slash and Duff were the tight brothers. I got pushed out. I didn't see it happening." Let's talk about Appetite For Destruction. It's now regarded as a classic, but when you were recording it, did you have the slightest notion that you were making something special? "I did, yes. I knew we were something special the minute we got in a rehearsal room together, the five of us. So when we were recording Appetite, I was telling the guys, 'This is great. The kids are going to love this stuff.' I knew we had something special." "Yeah, I had a stroke from cocaine. I was shooting it. You would think it'd be easy to kill yourself, but let me tell you, it's not easy." But that said, did you have a death wish? "Of course! [Laughs] Yes, I did. I went from having a band, a family, management, people who had my back to… being totally alone. I didn't know what to do. I didn't know where to turn. Management ripped me off of my money. It was very hard. I tried to kill myself. You would think it was easy, but it's not. The human body can put up with a lot. "I tried to kill myself many times. I guess I did succeed for a few minutes. I died by ODing, and I died in a car crash. You go to two different places when you die. When you try to kill yourself, you go to a very bad place, but when you die accidentally, it's a very nice place." Aside from feeling great, how is your health now? "Wonderful. In the last three months, I've lost 20 pounds. Put it this way: my first show with this band is going to be on the KISS Kruise, and I'm going to take my shirt off. [Laughs] I'm going to take my shirt off, and I will look good." I'm curious - you stopped taking drugs, but it wasn't until recently that you went to detox for alcohol abuse. "Yeah, that was the drinking, but I haven't done heroin or coke in over four years. Three days after the Rock And Roll Hall Of Fame, I got home and… I was drinking, and I couldn't stop. I knew I had to change. Six weeks after I stopped drinking, I lost 15 pounds - it was all alcohol weight. Put it this way: I have a new outlook. I want to achieve my destiny, and victory is a part of my destiny. I just can't drink. Drugs and drinking - I wish I could do it, but I can't. I did my share of that, and then some." You seem to have a good relationship with Matt Sorum these days. Was that always the case? "When I didn't like Matt, I didn't know him. I was jealous and hurt, and I was like, 'Who's this guy who's taking my job away?' But I didn't even know him. Then I got to meet him, and I realized that he's a wonderful guy and a great drummer. He's so smart, and he's an amazing storyteller. Sure, I was mad at first, but you know, if it weren't him, it would've been somebody else. He's a wonderful guy. He didn't do anything to me; I did it to me. It took a lot of growing up for me to see that." Leading up to the performance by you and some of the other GN'R members at the Rock And Roll Hall Of Fame, were you hoping that Axl would take part? "I was, sure. I really hoped that he'd do it. I was surprised that Izzy didn't do it, but he and Izzy have the same bond that Slash and I do. I was hurt and disappointed like so many other people. "Put it this way: I have this big poster of us in my dining room. It's a poster of Guns N' Roses from the first time we went to England. I have to walk by it to go to the bathroom. Before the Rock And Roll Hall Of Fame, I'd walk by it and go, 'Someday… ' But now I walk by it, and I say, 'I'm so glad that was a part of my life.' Once Axl didn't show, I realized that I was blessed that it happened the first time, and let's leave it at that. Now I have a new destiny." Let me ask you about your drums. What are you playing these days? Last question: The name of the band is Adler. What, you couldn't think of a better name? "I wanted to call it No Quarter, like, you know, 'take no prisoners,' but the rest of the guys were like, 'That's a Led Zeppelin song.' I said, 'So what? It's a great Led Zeppelin song.' But we went with Adler. Adler means 'eagle' in German. I would've loved to have called it Eagle, but you know, the Eagles have the Eagles." Yeah, it's kind of taken. "It taken. [Laughs] Adler was the next-best-thing. It's kind of cool. It sounds like a band. And everyone in the world knows who I am, so it works. No one has to explain that I'm in the band. It's Steven Adler, and this is the band. It's right there."